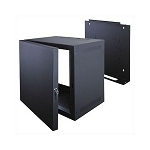 Designed to protect your security surveillance equipment, the VLBX Series Time-Lapse Recorder Lock Boxes house your precious video evidence in a solid, completely welded 16 gauge steel frame. A black powder coat presents a stylish look while providing a durable finish. To improve equipment access for servicing and still retain superior protection the top interlocks mechanically. A solid hinged door allows accessibility from the front and features a standard key lock. Overheating is managed by a 4-1/2" ball-bearing fan with a washable filter that comes installed by Middle Atlantic. 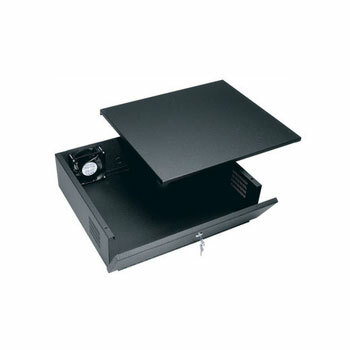 This Recorder Lock Box can be mounted with optional wall mount brackets, and the front panel can be replaced with a plexiglass panel (call for details). Available in two models, the standard model fits your larger VTR's while the 55 model is designed for VTR's with a low profile. *For cable protection around knockout holes try the Protective Grommet Roll for Wall Mount Component Cabinets. **Come with a 3 year warranty and are EIA compliant.